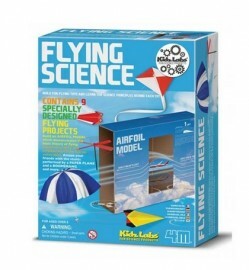 Kidz Labs Flying Science - spacekids - space toys, dressing up costumes, kids spacesuits, astronaut food, cool space stuff! Build fun flying toys and learn the science principles behind each toy. Makes 9 flying projects. Build an airfoil model which demonstrates the basic theory of flying. Construct a kite or a parachute for fun on sunny days. Amaze your friends with the stunts performed by a paper plane and a boomerang. Will keep the kids happy and outdoors in the fresh air for many hours. Neatly packaged, ideal for stockings too.